Meanwhile, we are still getting match news coming in from today's Nabisco games and Gamba's final match in the ACL group round. For the entire tournament information, >>click here. Overall a day without any impact in the results department. But it is certainly significant enough to point out how well Kawasaki Frontale are doing these days. They have no internationals on their squad, and have maintained their flavor and style while getting the results -- they are currently ranked 1 in the league, and this win over Oita means they are through to the finals with one game left to play. FC Tokyo's Moniwa, who started in the Nabisco match today, commented that he had actually not been in the proper state of mind to really play. But that he wanted to push himself and challenge himself to take responsibility out there despite the tremendous disappointment and hurt at not being selected for the World Cup team. Others like Urawa midfielder Hasebe and Sanfrecce forward Sato also played a full game, though their expectations were probably not as high as Moniwa's. While I was away from the blog, Gamba and Verdy failed to win crucial matches in their bid to make it past the group rounds of the Asia Champions League. Gamba slid to third place after losing 0-2 to China's Dalian Shide on April 26 and then drawing against Korea's Chonbuk Motors 1-1 on May 3. Today, Gamba played Da Nang away in Vietnam, and won 5-1. Verdy had only one team to beat (Ulsan Hyundai Horang-i) in the group but lost both legs, 0-1 and 0-2. The first 2006 Yamazaki Nabisco Cup group round games took place last night. You will be able to find the most recent games results at the bottom of the left column, and all of the tournament fixtures and results listed on >>this entry (this page will be updated as the rounds continue). Since I don't have access to viewing all the games, I can't do game reviews. But here are some highlights. With the group rounds taking place while the national team players are missing, one of the highlights of these games is to see rookie and young players used and see what kinds of changes managers make to their squad. Jef Chiba: current title holders Jef had apparently declined the option given to them to skip the group rounds and leap ahead to the knock-out tourney. The club is holding fast to their work ethic, saying that for the growth of the players and club they wish to force themselves to earn the right to make it past the group rounds. I think a predictable victory for Jef, though they are still a little shaky in the second half. Yuto Sato (whose twin brother Hisato has been called up for the NT friendly against Ecuador tonight) scored the winner for Chiba. Sanfrecce's Koji Morisaki (who also shares the J leaguer's career with twin brother Kazu, also a Sanfrecce player) was placed in the forward position (he's usually a midfielder) by manager Ono. He's been in a funk and has been out of the league games, so this was a good way for Ono to bring K.Morisaki back into the game. Fukuoka will have to wait until April to get their first win in the J1. This match-up with Yokohama resulted in only 6 shots taken (only 1 shot in the first half), reflecting the degree Marinos overwhelmed them. Avispa are hurting, with many regulars injured. The club's priorities for the league outweigh Cup responsibilities. 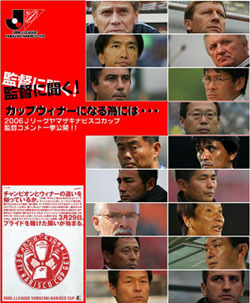 This meant that in order to rest most of his players for league duties, manager Matsuda switched out 6 regular starters -- two of the switched-in players were making their professional debut -- allowing them to just eke past the Jleague rules concerning player selection. (The rule for the Nabisco is that 6 of the players have to have started in 1 of the 5 league games so far.) Avispa have 2 losses 4 draws but still 0 wins. When Osmar scored for Oita at 59 minutes, the atmosphere in the team was on the up and up. They had closed the gap to 2-1 at that point, and motivation to catch up and surpass Kashima was high. Oita boss Chamusca made sure express his irritation at the 82nd minute PK call by the ref, which game Kashima their third goal. "We were trying a new system with some new players, and just as we were getting things together in the second half the ref destroyed our motivation." (Chamusca) Kashima's Tashiro scored his first goal in almost a year -- a header off Araiba's free kick. Tashiro injured ligaments in his left knee last summer. Antlers' Masuda also made an impact with two goals. Escudero marked his first official match goal last night. At 17 years 6 months and 28 days, this makes him the second youngest player to score a J goal (after Verdy's Morimoto). Escudero, as you know, is currently holding Spanish and Argentinian dual citizenship, but dreams of playing for Japan in the future. A truly multi-goal game typical of these two clubs. Kyoto were desperate to catch up after allowing Kawasaki to take a 2-goal lead in the second half, putting in Alemao and Paulinho, but it was just not enough to catch up in time. Sanga's defense line fell apart, and it took them a little time to get it back together. Kawasaki's Marcus ends the night with a hattrick -- what is this, the third hattrick for a Frontale player? The first games for this year's Yamazaki Japan Nabisco Cup will be played on Wednesday March 29. The group stage is complete, I will lay out the tournament in the space below. So, after Kashima's almost too-thrilling game against Sanfrecce in the opening round, they have been struggling to find that sense of strength. In the first round, the first goal (a PK) was awarded when 17 year old right sideback Uchida (pic) challenged the Sanfrecce defenders just inside the box. I was really proud of him because given his sudden promotion to the starting team and it being an important opening match, he took the risk and the challenge and instead of passing to someone else to make a play he took on the responsibility himself. In this game, it was Uchida again who made the first goal and assisted the second. And in this team with all its veterans and players with international experience this teenager was the one to make the difference and has started to solidify a place for himself. I am especially rooting for the youth generation of players who are playing/starting in side positions at their clubs (which is why I am putting this game review first today). Especially sidebacks. The Japan national team (and Japanese football on the whole) is sorely in need of experienced sideback specialists. This came from the fact that up until recently most J teams were playing with a 3-back defense line to stabilize defense and utilize the numerous quality midfielders. Sideback is a very difficult position, and even looking at other countries and clubs around the world, we see there aren't many truly stellar sidebacks. Currently in the J, we are starting to see vacancies in the sides get filled with the young players -- they are getting experience from an early age at the pro level, which is very good indeedy. Back to the game: It was a warm spring afternoon at Kashima stadium -- in fact I think it was the official sakura (cherry blossom) blooming day in Tokyo (this is an announcement by the people who go around counting how many cherry blossoms are flowering in different areas of Japan, and declaring when the blossoms are officially "open for business"; in other words, when Japanese people can swarm the parks and eat and get drunk under the sakura trees to enjoy and celebrate the arrival of spring before the petals all flutter to the ground. For a sample photo, >>click here. This photo was taken in Nagasaki in a prior year, and looks like it was taken when the trees were in full bloom). Kofu's "Mr #10" Fujita returned to the starting squad, and Ishikawa who had been filling in for Fujita was able to return to his original position up front. Kofu started off with a 4-3-3 system similar to the one from the end of last year. Kashima's defensive half Fernando had reinjured his knee and was off the team altogether. Masuda filled the spot. It was actually good to see manager Autuori not push Ogasawara down to defensive half like Cerezo did last year when they needed someone to quickly fill in for Fernando. Though the circumstances are a little different now than they were back then, for Kashima's attack to work Ogasawara really needs to be close to the front. Antlers dominated from the beginning with technique and elegant passing. But they couldn't quite find the space to move forward against a very defensively united Kofu who were waiting for the opportunity to counter. It was starting to look like the same old story of Kashima dominating the midfield but unable to find the final pattern for a clean shot on goal. Though Kashima were able to prevent Kofu from creating anything dangerous, they themselves were stuck as well, and it was starting to feel flat and uncomfortable. It was then that Uchida cut through the stale air. At 26 minutes, he received a ball on the right side from Aoki, and slid around the oncoming defender while holding furiously on to the ball. He dribbled in towards goal, and took a nice left footed shot for the goal. With that goal, the team was able to revive its spirits.